A new year, a new show. “New Vibrations” has opened at the USCB Center for the Arts. The Art Beyond Tradition group has brought its magic to the university’s gallery on Carteret Street. Twelve abstract artists have put together an exhibit of new works. 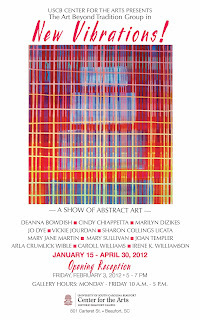 The show will run through April 30, with an opening reception at the gallery on Friday, February 3 from 5-7 pm. The public is invited. The artists who reside on Hilton Head Island, in Bluffton, Beaufort and Columbia, SC are known throughout the area for their unique style and exquisite artwork. They include painters Deanna Bowdish, Cindy Chiappetta, Marilyn Dizikes, Jo Dye, Vickie Jourdan, Mary Jane Martin, Mary Sullivan, Joan Templer, Arla Crumlick Wible, Caroll Williams and Irene K. Williamson, and sculptor Sharon Collings Licata. Vickie Jourdan’s “Attitude,” where bold reds and blended hues ring true to their title, is a painting that says as much about the artist as the observer. Far from subtle, it asserts itself dramatically. Sharon Licata works in stone. Her sculpture named “Thunder” shows an amazing flexibility of design. The stone seems to swirl and wrap around itself forming an open space that defies credibility. Mary Jane Martin has produced a painting titled “Java.” Colorful patches appear to be escaping from the muted background, whereas in “Grounded,” a muted palette is used, playing to texture and text. Following some of the concepts of color-mass abstract painting, Arla Crumlick Wible has produced studies in Brown, Browns and Greens, while Irene K. Williamson brings a collage named “Interrupted” as well as an abstract painting called “Out of Control”. In this second painting, the vigorous swirls of color and mad splashes and dashes of paint appear to be out of control, yet the total environment is that of a carefully controlled painting. Art Beyond Tradition has been together and showing its work as a group since 2007. The artists held two successful shows at the Arts Center of Coastal Carolina and most recently at the Coastal Discovery Museum on Hilton Head Island. For more information about the group and its work, contact Irene K. Williamson at 843-689-5088, or by e-mail at [email protected] . All of the artwork in the show is for sale. 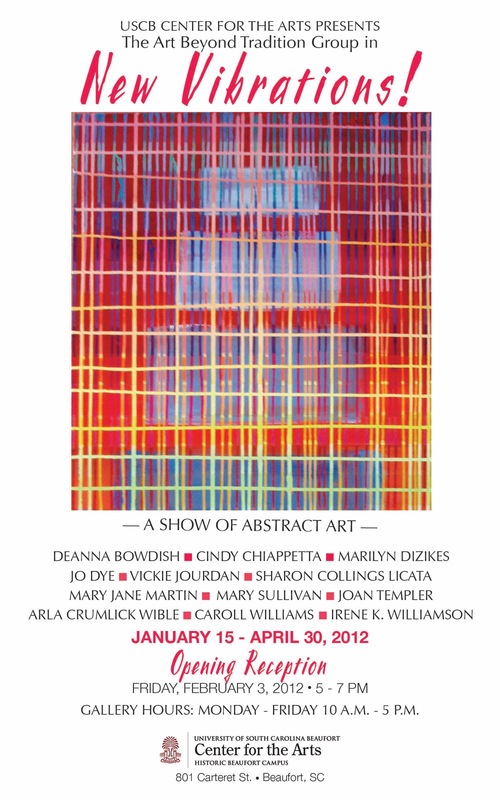 We invite everyone to stop by the gallery space of USCB at 801 Carteret Street in Beaufort to see this splendid show. For more information about the University of South Carolina Beaufort, please visit www.uscb.edu online or call the university’s Office of Public Information at 843-208-8030.